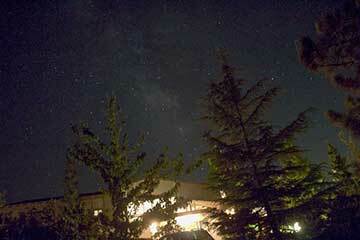 Well, how can it be that this is the 201st post on the Palmia Observatory blog site. It has been over 3 years now since I began this journey as a physicist wannabe and an astronomer wannabe and the journey still continues. Hey, maybe if I had just gone back to formal school, I would be done by now! But as all the rest of you amateurs and wannabes know, there is usually not enough time in the day to get everything done and so the journey continues. Even with help from the other observatory staff, like Astronomer Assistants Ruby and Danny, it seems that I end up doing most of the work. 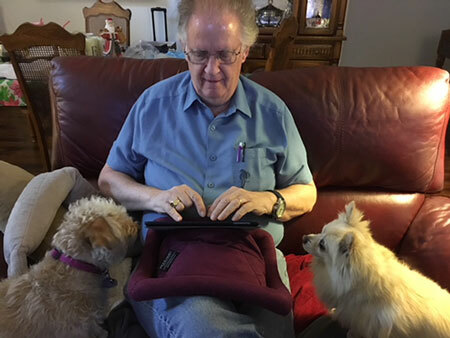 Blogging can be done inside and now that the Santa Ana winds have really been blowing here and what with the ongoing wildfires we have been a little hesitant about doing any outside observing also. Instead, let's review some other inside topics and ideas. 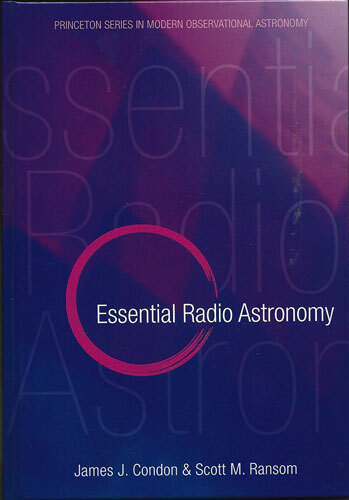 Remember we have been viewing The Great Courses DVDs on Radio Astronomy and find that they have been very informative. The lecturer, Dr. Felix Lockman, goes into some of the technical details very quickly and in order to follow up and work through some of the technical issues, I found this to be a really great textbook that is just at the right technical level. 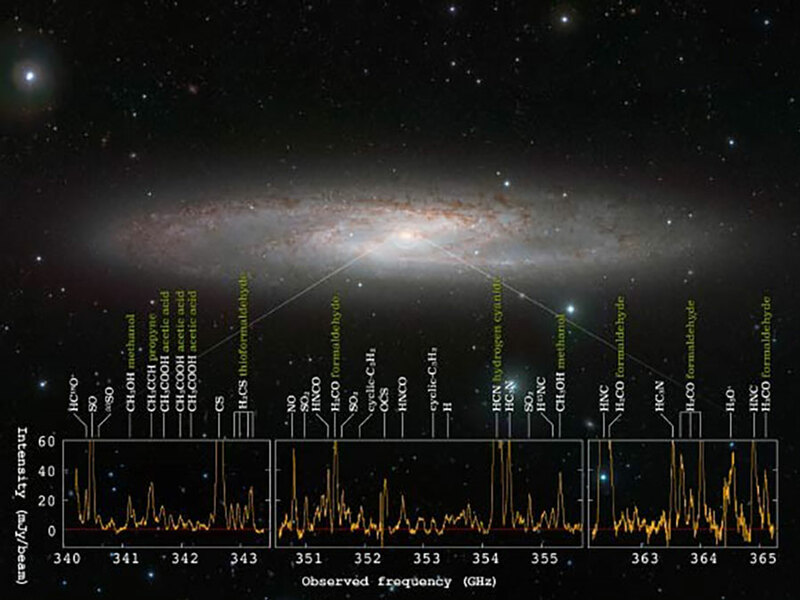 The key thing right from the start was the discussion of the physics of the sources of radio emission found in galaxies and other deep space objects. Remember that the sources divide into two basic groups: (1) Thermal sources, and (2) non-thermal sources, such as Synchrotron radiation and free-free or Bremsstrahlung radiation and quantum transition radiation. Each of these sources depend on the physical conditions under which they are formed and can deliver a lot of information about the conditions. 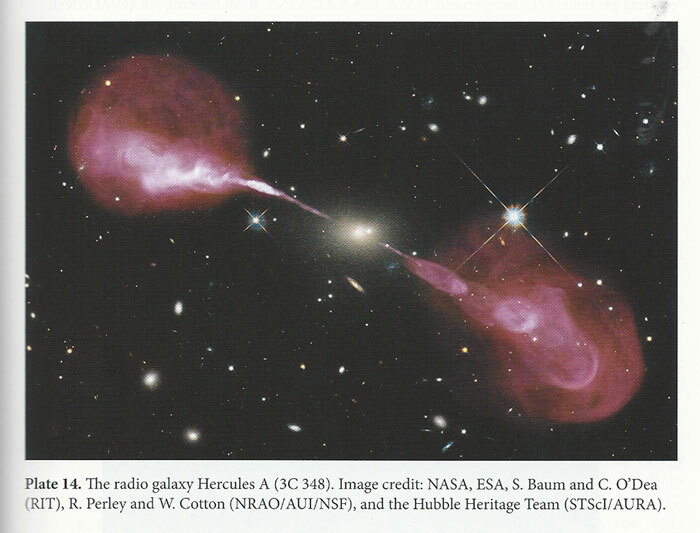 The dual jets emitted by the galaxy are not seen in visual wavelengths, but the jets and red lobes, where interaction with gas and jets, are visible in radio and x-ray images. The Very Large Array in Socorro, New Mexico was used for this image of 3C348. Sometimes, only one jet is seen in radio observations, but this is not thought to be a special condition where only one jet is generated in the galaxy, but where only one jet is visible to us here. Check out the image of 3C175 below which shows an example of seeing only one jet. The textbook and DVDs explain that the reason only one jet is observed. This is due to "Doppler blooming" or relativistic beaming. 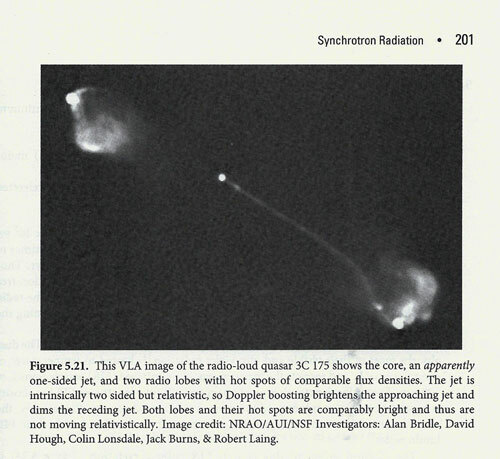 The jets are particles accelerated to such high velocities close to the speed of light and the relativistic effects as seen by our observational point must be taken into account. The jet that is in our direction will have its apparent brightness increased and the other jet, moving away from us, will have its brightness decreased, often by several orders of magnitude. 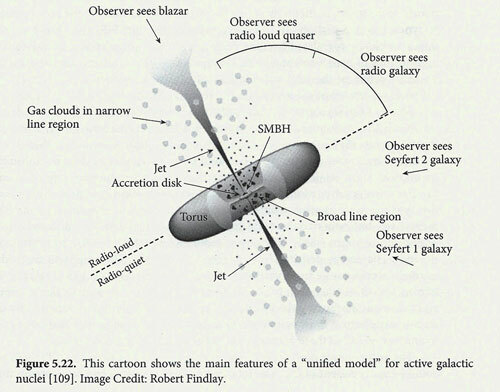 The cartoon below shows how many of the weird observations of radio galaxies need not be representative of new and different objects, but instead just due to our observational point of view. So whether you see a blazar, or a radio loud quasar, or radio galaxy or Type 1 or 2 Seyfert galaxy can all be due to the same type of object. This common object is a supermassive black hole surrounded by an accretion disk, whose material falling into the black hole powers the formation of the jets. Radio astronomy relies more and more now on the use of large arrays of telescopes, even across the entire world, that are interconnected to perform as a single large interferometer, which enables very good angular resolution of sources, often better than a milli-arcsecond, which is needed if you want to see what is happening inside a galaxy located thousands of light years away. The frequency bands now used have increased much higher than the 1.42 GHz wavelengths used to monitor the distribution of neutral hydrogen, to over a hundred times higher. These higher frequencies an be used to observe some of the quantum transitions of molecules, like carbon monoxide, water and other larger organic molecules. The other good news is that the resolution of a radio interferometer gets better as the frequency gets to higher and higher values. Check out this image from ALMA which shows the range of molecules found in large molecular clouds inside of NGC253. I guess we now have to schedule tours of these large radio telescope observatories like the VLA in Socorro, New Mexico, ALMA in Chile, and of course Green Bank Observatory, which is already on our calendar. By the way, if you haven't been to the Owens Valley Radio Observatory, in northern California, you should check out tours up there. We attended an OCA sponsored tour a couple of years ago and found it very interesting. Also don't forget the free OCA general meeting tonight, Friday, Dec 8 at Chapman University, where we will hear a speaker describing "Spinning Black Holes, Exploding Stars, and Hyperluminous Pulsars: Recent Results from the NuSTAR Satellite."